Gold Coast Titans are an Australian professional rugby league football club, based in the Gold Coast, in Queensland, Australia. The club competes in Australasia's elite rugby league competition, the National Rugby League (NRL) premiership. It is the newest of the sixteen clubs in the league, having commenced its inaugural season on March 18, 2007. Since 2008, the Titans have played their home games out of Skilled Park, located in Robina, Queensland. 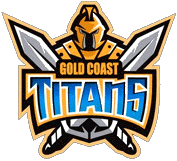 The Titans are the second top-level rugby league club to have been based on the Gold Coast, the first being the ill-fated Gold Coast Chargers (also known as the Giants and the Seagulls), which existed from 1988 to 1998. The re-introduction of a Gold Coast-based team, since the Chargers were cut from the NRL competition at the close of the Super League war, has been viewed as highly successful. The Titans' case is often used in arguments by those in favour of the re-expansion of Australasia's competition. The beginnings of a Gold Coast team's bid to return to the National Rugby League began when the Australian Rugby League decided to remove the financially successful Gold Coast Chargers from the National Rugby League at the end of the 1998 Season. The ARL wanted to have a second major team based in Brisbane and believed the best way to achieve this was by removing the Gold Coast team from the competition. The attempt to launch a second Brisbane team failed and in 1999, Michael Searle, former Gold Coast Chargers player and Managing Director of International Sports Australia, formed a Gold Coast Bid Team. The team included former Chargers boss Paul Broughton and was labelled as "The Gold Coast Consortium" by the media. The board were constantly active in lobbying the NRL to both expand the competition and consider the Gold Coast's bid for inclusion. They were successful in organising pre-season NRL trial matches to be hosted on the Gold Coast and with average attendances of over 16,000, and peak attendances topping 20,000, the popularity of rugby league on the Coast was clear.